JEAN-PIERRE LE CADRE started his career in 1980 and spent his first ten years as an engineer in a lab of the French Defense Department. At that time, the major topic of his research was array processing, and he wrote several influential papers. 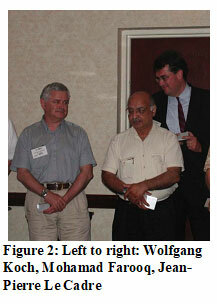 For one of them, he received the best paper award from the European journal Signal Processing. This paper actually was the bridge with the second period of his fruitful research; indeed, he started his interests in the way of taking the motion of targets into account in array processing. From the very beginning of the 1990s, he invested his research effort in tracking, including target motion analysis, data association, sensors networks, and operation research. He wrote 50 journal papers and supervised 15 PhD students during his too short career. He was a recipient of the IEEE Barry Carlton Award 2008 for the paper “Closed-Form Posterior Cramér-Rao Bounds for Bearings-Only Tracking”, published in IEEE Transactions on Aerospace and Electronic Systems (Vol 42, n°4, pp 1198-1223, Oct. 2006). He published in various journals: IEEE, IEE, SIAM, Signal Processing ... A characteristic of his papers is their length: his generosity revealed itself even in his writings. JEAN-PIERRE was a very good companion. He loves humor and cultivated thoroughly friendship. He was very sensible about social and political problems. His natural curiosity put his culture at the same level as his scientific savoir-faire. A discussion with him around a good wine was a privilege, and an unforgettable experience. A favorite topic of him was the social history of the coal-mine workers. They represented for him what hard-working means, what social struggles imply and the grandiose wells these men dug fascinated him. If we want to summarize his spirit in one word, it would be: he was a humanist. He was born in 1953 and left us in July 2009. His scientific trajectory was brilliant and we all have to learn from the exceptional contributions he brought to our community.